looks like scuppers are plugged. Water should not be able to get that deep. That being said water wont hurt hull, battery ? Talked to the broker, salvaged from hurricane Irma. Hole in engine cowling and boat was submerged in an unknown depth of water. 14k ? Looks like a great project starting point. 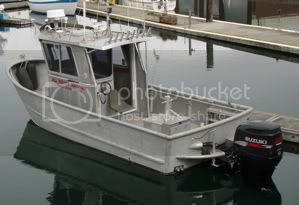 I’m really tempted to hire a marine surveyor. No trailer, additional photos are here. What do you guys think? Broker told me there is a good dent on the starboard side. Is 14 his number or yours? It’s a bid sale, February 1st is the auction, much like EBay. 14k is his price, has a regular title not salvaged. Seems like it would be hard to get hurt at that kind of number. Repower, rewire, rerig . . . only thing is the dent will be tough to fix if you want it to totally disappear. Looks like the bow eye where it attaches to the trailer was ripped out, nice crease in the right side. Looks to be a pretty bare bones model, no transom door. Would be a good sales pitch for Pacific boats, surviving a hurricane. I know the perfect name for it “IRMA”. Waiting for a reply back from Pacific. Current bid is 7k, might be a good deal? I emailed the photos of the dents and gouges in the hull to Pacific to see if they could be repaired last week, no reply don’t think they are interested in used Pacific’s. If only I were closer, talked to a couple of local Florida Marine surveyors who weren’t to interested at looking at it, both had negative comments about the broker. I held off bidding, last time a checked it was at $7500.00. Just too many unanswered questions. Still looking !! !